We have completed all of the major activities leading up to launch. The rocket is on the launch pad and ready to go. Family and friends were able to attend the rollout which, of course, is a highlight of the Baikonur experience. Today, the State Commission formally gave a report of readiness and go for launch. A press conference followed immediately after that. After a short break, the prime and backup crews watch the Russian movie classic, White Sun of the Desert, as is the tradition here the day before launch. We are grateful for the work of many dedicated to the cause of human space exploration. The teams within the international partnership located here in Baikonur, in Russia, the United States, Europe, Japan and Canada are responsible for the tremendous achievement that we call the International Space Station. Our hats are off to them. We are also grateful to our backup crew. They and their families have sacrificed much to complete the training and obligations of a backup crew. Alexander and Shannon are scheduled to launch next year and we look forward to seeing them on orbit at that time. It’s early evening here now. Launch day starts early. We wake at 04:30AM, have breakfast, and soon after depart the crew quarters in a traditional way. Our wives will join us in a small group for a final farewell. There will be the door signing, the blessing, and the walk out the building through the gauntlet of media along with our friends and coworkers who will line the sides of the walkway. We will then board the buses and take the 45 minute drive to the Cosmodrome. There we will suit up, conduct pressure checks of the suits, take the bus to the launch pad, ride the elevator to the top, ingress, and complete the countdown. You can watch it all as well as the later flight activities on NASA TV on this schedule. Everything is progressing smoothly. The Soyuz TMA-16 is in its shroud, or rocket fairing. The weather has been terrific here in Baikonur. Several of us have been running in the desert every day, crossing paths with camels, cows, goats, wild horses, and the occasional shepherd. Yesterday, we did our final check of the spacecraft before it gets mated to the rocket and prepared to go to the launch pad. All of the cargo was loaded for flight. Everything looked great. We also spent time looking over the new research module launching in November. It also is in very good shape and Max and I look forward to integrating it into the ISS later in the year. After that we visited the building where the Soyuz-FG booster rocket is being assembled. The 1st and 2nd stages were assembled and the 3rd stage was being readied. Today, the rocket parts all will come together as the team prepares for tomorrow’s rollout. Our families and friends converged on Moscow over the past several days and will travel today to Kazakhstan. We will get a couple of opportunities to visit with families beginning this evening and all of us on the crew are looking forward to that. We are well into our 4th day here and all is going well. The first “fit-check” of the Soyuz spacecraft went very well on Friday (L-12 days). The vehicle is in great shape and we got our opportunity to practice the ingress and strap-in as it will go on launch morning. This is my 4th time through this process—twice on backup crews and 2nd time as a prime crew—and I continue to be impressed with the rich history and tradition in this place. It continues to be largely unknown to many around the world and, particularly, in America. Our participation in the Russian program as crewmembers goes back to Norm Thagard, who launched on Soyuz TM-21 in 1995 spending over 115 days on the Russian space station Mir. It was he, along with others who supported and participated in the Shuttle-Mir Program, who blazed the trail of Russian operations for those of us privileged to follow. They were largely out-of-sight and out-of-mind. I encourage you to read through the history of the Shuttle-Mir Program. The coming week will be relatively relaxed with procedure reviews for the different flight phases, docking training on a laptop based simulator, review of Soyuz operations, and continuing preparation of the flight checklists and references. The pace will pick up significantly on L-5 days. In the mean time, there is some opportunity to get the many personal details organized. Greetings from Star City, Russia—the Gagarin Cosmonaut Training Center—just outside Moscow! Our Soyuz crew—Maxim Suraev, Guy Laliberte, and I—are just finishing up our training for a flight to the International Space Station (ISS) and heading to the remote location of Baikonur, Kazakhstan, for final launch preparations on the Soyuz TMA-16. 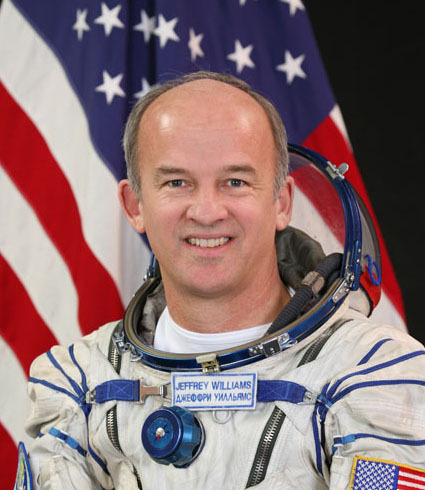 I am NASA Astronaut Jeff Williams and this will be my 3rd flight to space, 3rd trip to the ISS, and 2nd long duration expedition to the orbital outpost. Max and I will remain on board ISS for nearly six months executing the missions of Expeditions 21 & 22. Guy will remain on board for about 9 days and return to earth with the crew we are replacing. It has dawned on me that very few have had a glimpse into the very interesting and historic world of human spaceflight, especially behind the scenes in the preparation and execution. That is the case for ISS, in general, but especially true in Russia and Kazakhstan with an American on a Russian Soyuz. Because of that, I’m going to attempt to provide some background, describe the experience along the way, introduce you to the rest of the team, and let you vicariously come along on the journey.